Frances Taylor officially founded the religious order the Poor Servants of the Mother of God in 1872. Her spirit and values form the thread which runs through all the work undertaken by the Congregation. On her return to London she continued to work with the poor and also began writing. Her desire to work for and with the poor, led her to found her own Congregation in 1869. Frances took the name Mother Magdalen and together with three companions began the work of the Poor Servants of the Mother of God. They responded to the needs of the time working with the most vulnerable, especially women and children, and recognising and valuing the dignity and worth of each person. Today, the Congregation carries out work begun by Frances Taylor in social, pastoral, health care, education and outreach work in the UK, Ireland, N. America, Kenya and Italy. We seek to have Venerable Magdalen of the Sacred Heart canonized for a variety of reasons, though none more important than her role as Prophet. A Prophet communicates God’s message. The message gives a vision to the world that inspires people and encourages them. She was inspired to write a book, Eastern Hospitals and English Nurses – an expose´ showing the neglect of the soldiers, and the injustice and indignities they suffered. As Prophet, her message was: It is not sufficient to accept things the way they are. People deserve better and they should get it. 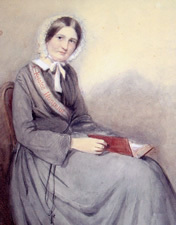 She called for the reform of the character of paid nurses, whom she often found to be drunk, immoral and insubordinate. The horror for Venerable Magdalen of the Sacred Heart was that sick and dying patients were left in the care of these so-called nurses. Consequently, she was not willing to accept things the way they were; things should be better and most certainly the sick and the dying deserved better. In the Apostleship of Prayer program, a person unites with the intentions of the church daily all over the world so as to be as close as possible to the mind of the church in its concerns and prayers for its suffering members. Prayer touched the two great loves of her life – the Sacred Heart and the Poor. As an encourager, she convinced Fr. Dignam, SJ, to change the Messenger of the Sacred Heart from being an expensive literary magazine into a popular penny-worth magazine which quickly circulated freely among the poor. She further encouraged Fr. Cullen, SJ, in Dublin to make the magazine available to people in Ireland. Within a year, the first Irish Messenger of the Sacred Heart appeared, reaching a circulation of 73,000. This Messenger is still published in Ireland today. The fourth mark of her being Prophet is found in her call to be the Foundress of our Congregation, the Poor Servants of the Mother of God.